Crappie anglers use some small lures and line to catch their favorite fish, but there are times when they have to use even smaller stuff to coax bites. I have faced this situation on my home lake where the water is so clear that I actually sight-fish for spawning crappie. The fish tend to ignore standard size tubes and grubs as the fishing pressure builds in the spring, but I can still catch these bedding fish by scaling down to 1-inch Southern Pro Tackle Lit’l Hustler Crappie Tubes or Bobby Garland Crappie Baits 1.25-inch Itty Bit Swim’R lures attached to 1/48- or 1/64-ounce jigs and tied on 2-pound-test line. I use the same lures for catching crappie at night under a light during the summer. The micro-sized lures work best because they are the same size as the minnows hanging around the light. 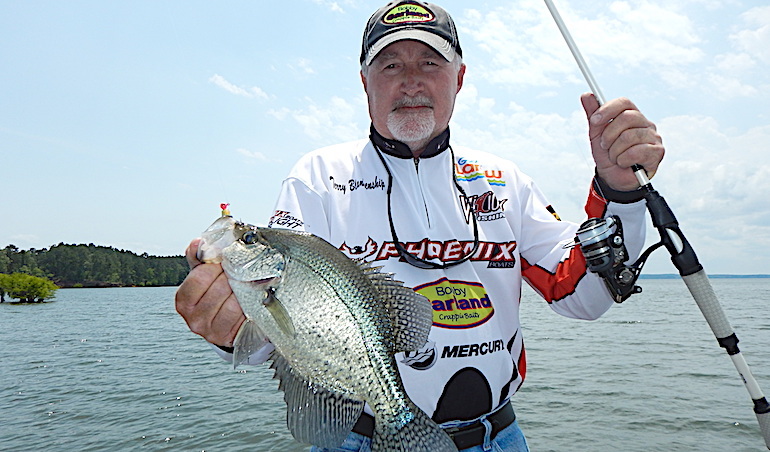 Three veteran crappie anglers who also use tiny baits to catch crappie when conditions are tough or when they want to match the size of the forage are Gary Rowe, Terry Blankenship and Brad Chappell. When fishing 10 feet deep or deeper, Rowe rigs a Bobby Garland Itty Bit Swim’R or Itty Bit Slab Slay’R on a 1/48-ounce or 1/64-ounce jighead and crimps a 1/16-ounce split shot above the lure to give it added weight. The post-spawn in the spring is Rowe’s favorite time to throw a tiny jig. He favors a large bait during the spawn when crappie are more aggressive and attack bigger lures, but he scales down when the bite gets tougher during the post-spawn. A micro bait is most productive for Blankenship after a shad hatch when the baitfish are about an inch long. Blankenship uses Itty Bit baits and adds weight to his 1/48-ounce jighead to fish deeper water by crimping a split shot about 1 foot below the lure or uses a double rig with a 1/16-ounce jig and a 2- or 2 1/2-inch soft plastic bait tied about 1 foot below the Itty Bit. Downsizing to catch more crappie pays off for Brad Chappell during guide trips when crappie are transitioning from summer to fall. The guide usually spider rigs with minnows using a 1-ounce sinker between two baits. When he notices his minnows are larger than the forage he is seeing, Chappell replaces the minnows with Itty Bit Swim’Rs and Slab Slay’Rs attached to 1/64-ounce jigs and applies some fish attractant to add scent to the soft plastic lures.